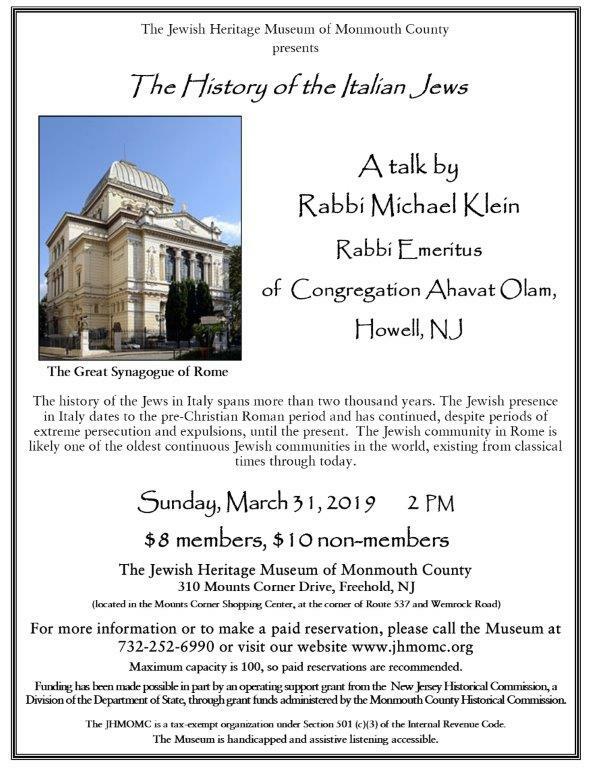 WHERE: The Jewish Heritage Museum, is located in the Mounts Corner Shopping Center, at 310 Mounts Corner Drive Freehold, NJ, at the corner of Route 537 and Wemrock Road (between the CentraState Medical Center and Freehold Raceway Mall). It is on the second floor of the historic Levi Solomon Barn. The history of the Jews in Italy spans more than 2,000 years. The Jewish presence in Italy dates to the pre-Christian Roman period and has continued, despite periods of extreme persecution and expulsions, until the present. The Jewish community in Rome is likely one of the oldest continuous Jewish communities in the world, existing from classical times through today.